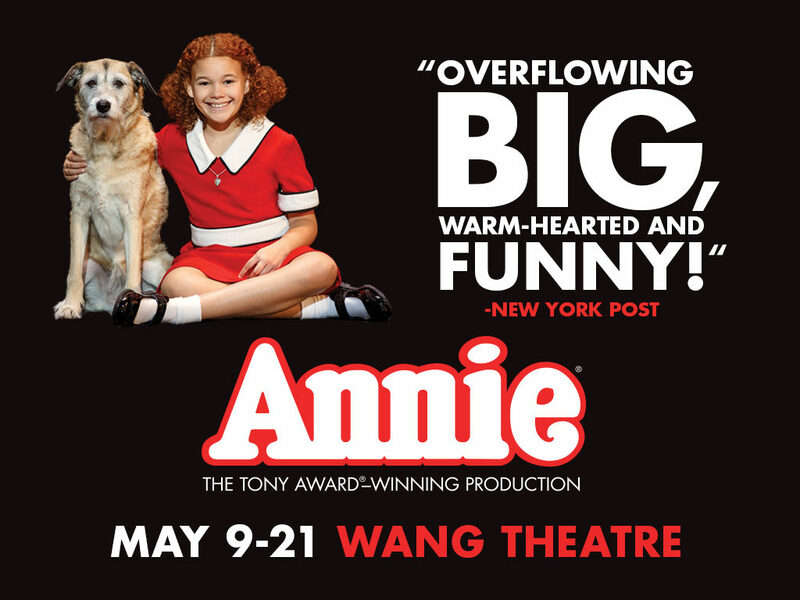 Flash giveaway: Win four tickets to see “Annie” at the Boch Center Wang Theatre! When I was a young kiddo, I got to see “Annie” on stage in Philadelphia. I know I can’t even tell you who was performing at the time, but the songs got stuck in my head for ages. Really, what’s better (as a kid) than seeing a rags-to-riches story AND THERE’S A DOG, TOO?! So perfect. And so it happens that when I was approached with the opportunity to give away tickets to this really fun show, which will be running at the Boch Center Wang Theatre from May 9-21, 2017, I had to hop at it. After all, the only thing better than going to the theatre is going to the theatre AND getting to bring some friends and/or family, right? What’s up for grabs? A family four-pack of tickets to see “Annie” live at the Boch Center Wang Theatre in the heart of Boston’s Theatre District. Sweet! So, can I use the tickets for any night? Nope. You have your choice of two different nights. Both shows are at 7:00pm. You can choose EITHER Tuesday, May 9, 2017 OR Wednesday, May 10, 2017. One or the other, not both. How do I get in on this giveaway? Just use the rafflecopter below and follow the directions. You can enter as many times as it’ll let you, up until 12:00am on Friday, May 5, 2017. Yes, this is a short-duration giveaway, hence the word “Flash” in the title. When will I find out if I won? The winner will be announced within one hour of the drawing, and I will coordinate with the lovely company that’s providing the tickets to ensure that you get the details you need in a timely fashion. Any other catches or restrictions? Like, what if I don’t live near Boston? Can I still win? Well, you CAN win, but you’re on your own for getting to the theatre, finding a place to stay, etc. That said, Boston’s a wicked good town and if you want to use this as an excuse to come for a quickie visit, have at it. Just make sure that you don’t end up having a “hard knock life” of your own by showing up without ID to claim your tickets. General rules: follow the rules and everybody gets along nicely. You earn entries based on your participation via the Rafflecopter widget, and this giveaway runs from 12:00am ET on Wednesday, May 3, 2017 until 12:00am ET on Friday, May 5, 2017. Only valid entries received during that timeframe will be considered legitimate. Anyone who commits fraud or tries to screw with the system, game the system, or otherwise not play nicely will be removed from consideration. Google for “Wheaton’s 1st Law” if you want to understand where I’m coming from, folks. The winner will be notified by email within 1 hour of selection. This blog is sponsoring this giveaway, which was kindly donated by the folks producing “Annie” for the stage. I did not receive any payment in exchange for hosting this giveaway; I was one of many bloggers offered the opportunity to attend a press night of the show and to host a giveaway. I only get the satisfaction of knowing someone else gets to have a good time at a show. THE WINNER MAY CHOOSE FROM EITHER THE MAY 9, 2017 OR MAY 10, 2017 PRODUCTIONS. BOTH SHOWS BEGIN AT 7:00PM AND WILL BE AT THE BOCH CENTER WANG THEATRE. THE TICKETS WILL NOT BE EXCHANGEABLE, TRANSFERRABLE, SELLABLE, OR ANY OTHER “ABLES”. IF YOU WIN THEM, THESE ARE THE TWO SHOWS FROM WHICH YOU CAN CHOOSE. AT THIS THEATRE. PERIOD. THE PRIZE ONLY CONTAINS TICKETS–YOU ARE OWN YOUR OWN FOR TRANSPORTATION, LODGING, REFRESHMENTS, AND ANY OTHER EXPENSES RELATED TO YOUR EVENING OUT. YOU MUST BE 18 OR OLDER TO WIN, AND YOU MUST BE ABLE TO PRESENT A VALID ID AT THE TIME OF TICKET PICKUP. VOID WHERE PROHIBITED BY LAW. ALL FEDERAL, STATE, PROVINCIAL AND LOCAL LAWS AND REGULATIONS APPLY. THIS BLOG IS THE OFFICIAL SPONSOR. ENTRANTS AGREE TO BE BOUND BY THE PRIZE RESTRICTIONS, ELIGIBILITY REQUIREMENTS, AND SPONSOR RULES. This entry was posted in giveaways and tagged annie, boch center, giveaways, it's a hard knock life y'all, musicals, wang theatre by crunchymetromom. Bookmark the permalink. Obviously our kids would freak and love this so much. Very cool giveaway! Thanks!